Have you ever noticed when you attend street legal drag racing events, the “Christmas tree” which is the staging light reacts different from the NHRA Pro drag racing events? You are correct, in drag racing there are two different types of sequence for the Christmas Tree. Both types will utilize the same staging sequence where the front tires of the race vehicle crosses the first invisible beam which indicates that the racer is about seven inches form the starting line. Once the front tires touches the first invisible beam, the pre-stage light turns on which is the two small bulbs at the very top of the Tree. The race vehicle would then roll inches forward and stop when the staging light turns on which is the two small bulbs right under the pre-stage lights (The staging light indicates that the vehicle is ready to race). Now, this is when the Christmas Tree will react different depending on the type of racing. 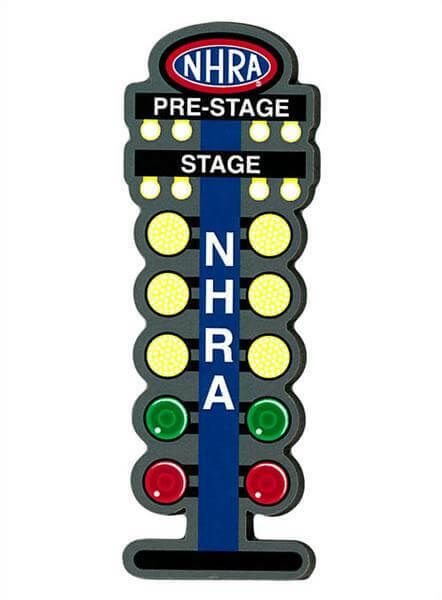 The first type which is mainly used by the NHRA Pro drag racing is called the Pro Tree. The Pro Tree is when all three amber lights flash simultaneously followed four-tenths of a second later by the green light ( green is when you gas the vehicle forward). It is always wise to try to gas the vehicle right when the green turns on but be careful you might get a red light which means that you jumped off the starting line before the green turned on. The second type which all of us street draggers are more familiar with is the Sportsman Tree. The Sportsman Tree is used for exhibition, Street Legal Drag events and other non Pro NHRA events (Dragsters, Funny cars etc.). The three amber lights flash consecutively five-tenths of a second apart, followed about five-tenths later by the green light. The Sportsman Tree allows us to have a bit more timing to get that perfect reaction time without hitting a red light. So there you have it, next time you’re watching or participating in a drag race event and wonder how the rules are set for the race, just look to see what type of tree they have set up.